They say a bride looks amazing on her best day. That also goes for this album spread featuring five bridal portraits captured during a Black Creek Pioneer Village wedding day before heading to the venue. Brides put a lot of effort in looking their best on the big day, and beautiful bridal portraits are crucial. About one year before her wedding day, after selecting the venue, the bride looks at different gowns to find the one they love. After the bride steps into her dress, it takes the wedding photographer two hours to photograph her. Because future generations see these portraits, everything needs to be flawless. The hair, the makeup, the dress, etc. 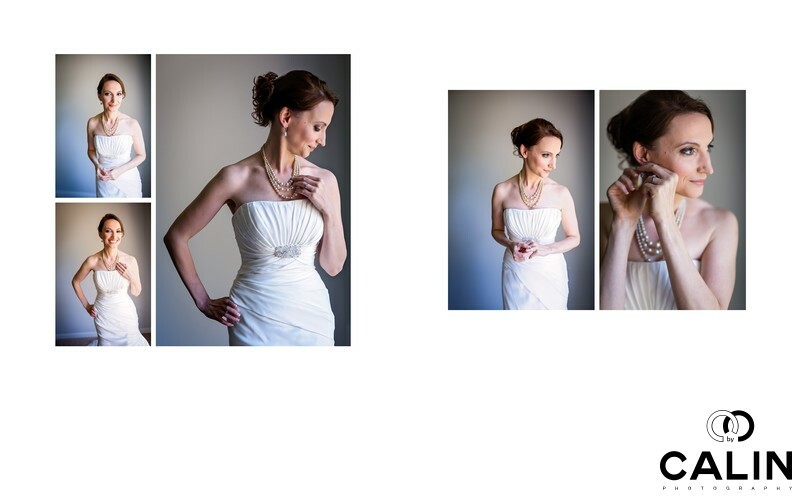 Here are five bridal portraits taken before the bride headed to the wedding venue for her first look and ceremony. The two photos on the left portray the bride looking at the camera. Her poses are simple and elegant, to match her style. The third image is a bit more complicated. Here the bride is looking down to her left and is touching her necklace. Next image shows an emotional bride clenching her hands. Finally, the last photo in this series shows a confident bride putting on her earrings. In these pictures, I placed the bride next to a huge window. The soft light and the natural vignette make this images look gorgeous. The bride and groom created a long list of banquet halls and venues that could host their guests on the big day. Eventually, the couple decided to have a rustic wedding and selected the Pioneer Village for several important reasons. First, they love the wedding chapel and the Town Hall, both splendid historical buildings and excellent locations for an indoor wedding ceremony. Second, the bride and groom realize that parking could be an issue in downtown Toronto so they opted for the village. Finally, they wanted a venue with gardens and open space where the guests could roam around and also very important, a banquet hall with a large dance floor. This wedding venue matched all the couple's criteria along with several country clubs in Toronto Ontario.